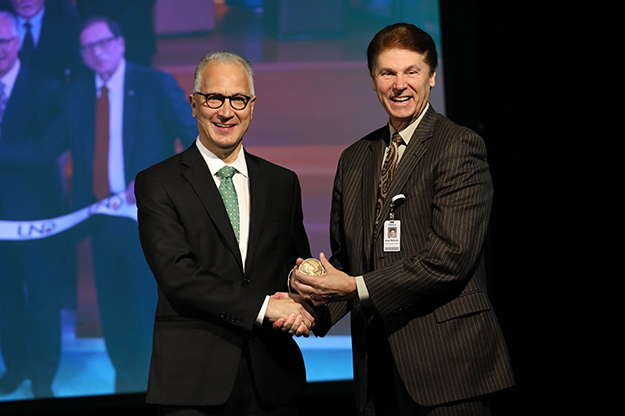 UND President Mark Kennedy awards the prestigious and rare President’s Medal to Dave Molmen (right), Altru Health System CEO. 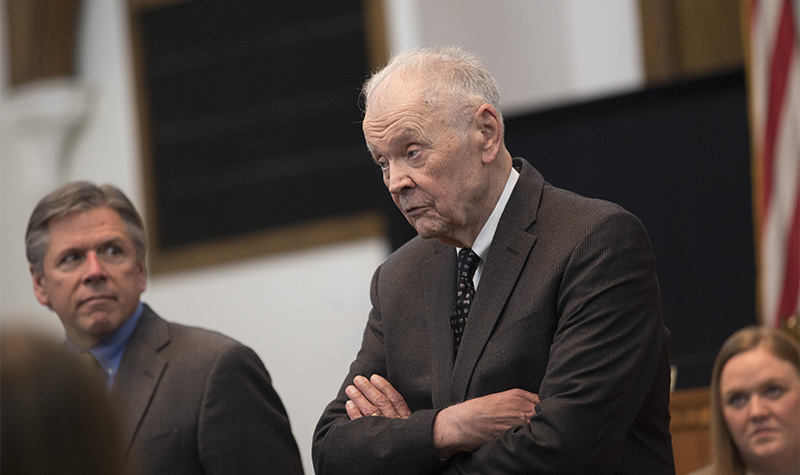 The medal has been bestowed only about 20 times since 1971 to people who have had positive influence on the University. Photo by Jackie Lorentz/UND Today. 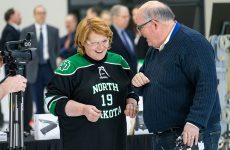 UND President Mark Kennedy kept with tradition on Tuesday, during his annual “Wake up to UND,” presentation by surprising one of his audience members with special token of appreciation. Kennedy capped off his nearly 50-minute address to the Grand Forks-East Grand Forks business communities by calling upon Altru Health System CEO Dave Molmen to join him on the stage to receive a UND President’s Medal. 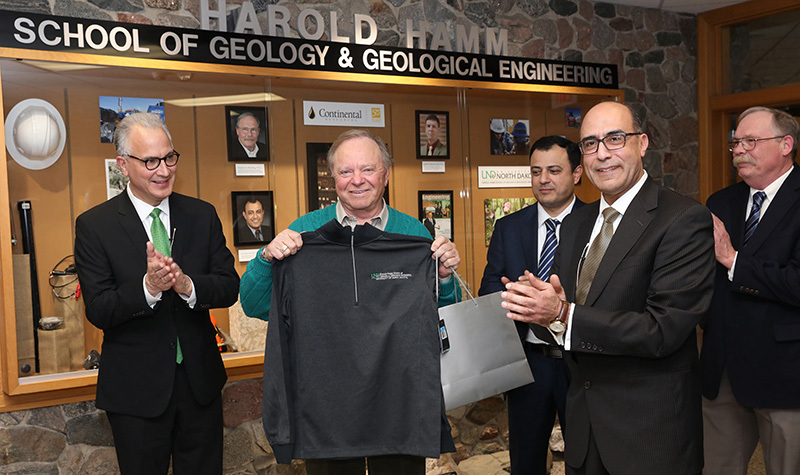 The award has only been bestowed only about 30 times since 1974, spanning five University Presidents. In front of a large screen displaying a picture of Molmen and other UND administrators at the 2016 ribbon cutting for the new $124-million UND School of Medicine & Health Sciences (SMHS), Kennedy informed the crowd about how instrumental Altru CEO was to making that day a reality. “We perhaps would not have had that ribbon cutting,” Kennedy said “We perhaps would not have the phenomenal medical school that we have today, if we did not have our leader from Altru, Dave Molmen, who partnered with our medical school to do so many wonderful things. Molmen told The Grand Forks Herald, after receiving the medal, that he was humbled beyond words for receiving the award. Molmen, a longtime member of the Grand Forks community and current chair of the UND SMHS Advisory Council, has a leadership tenure as CEO that spans to a time when Altru Health System was known as United Hospital. Molmen has led a period of rapid growth and regionalization for Altru Health System. He was key in the creating of Altru Health System in 1997. Prior, he led integrations of The UND Medical Center Rehabilitation (The Rehab) into United Hospital, and clinics throughout northeastern North Dakota and northwestern Minnesota into Grand Forks Clinic. Molmen, a trailblazer in the healthcare industry, also led efforts, along with former Altru President, Dr. Casey Ryan, to become Mayo Clinic’s first affiliate of the Mayo Clinic Care Network, now recognized as a worldwide network of premier health providers. Throughout the region, he also spearheaded the development of major partnerships for community health with Altru Family YMCA, Choice Health and Fitness and the University of North Dakota. Molmen is a member of the American Hospital Association Board of Trustees and is the Chair of the American Hospital Association Regional Policy Board for Region 6. Molmen also held a CEO position with Midwest Medical Group in Denver, prior to his more recent leadership roles at Altru. Molmen is a graduate of Concordia College in Moorhead, Minn., where he received a bachelor’s degree in healthcare, finance and psychology. He received his master’s degree in public health and advanced studies in health services administration from the University of Minnesota. Kennedy last presented the President’s Medal to the late Sarah Nissen, who served as executive director of UND Marketing & Creative Services, for her leadership efforts in instituting a number of sweeping and successful marketing changes at the University. 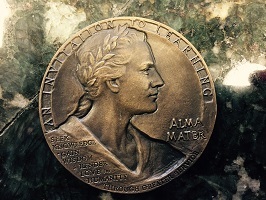 The obverse of the President’s Medal. Fairbanks served as sculptor-in-residence at UND in 1966 and earlier created the iconic pioneer family monument that stands today on the State Capitol grounds in Bismarck. 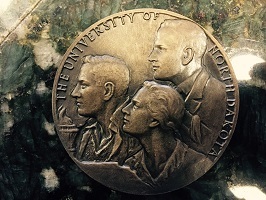 The reverse carries an image of three anonymous people (two males and a female), eyes fixed forward toward a torch, with a heading that reads “University of North Dakota,” circling the top. Others who have received the honor include Ed James, former medical school dean; LeRoy Sondrol, former director of plant services, Don Piper, professor emeritus of the College of Education & Human Development; Bob Boyd, former UND vice president for student affairs; Pat Bohnet, former executive assistant to the UND president; Alice Brekke, former vice president for finance and operations; and Laurie Betting, former UND Vice President for Student Affairs. Current UND employees who have received the award: Tom DiLorenzo, Joshua Wynne, Peter Johnson and Dana Harsell.